When: Saturday, March 2nd from 10 -12pm. Tori Motyl will present the basics of creating macrame hangers for your pottery in this 2 hour workshop! She will cover designs and knotting. 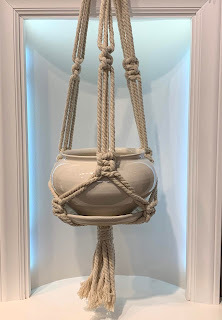 Participants will walk away with macrame hangers for their pottery and the knowledge to recreate on their own and take their newly learned skills to the next level. It’s time to elevate your pots.. literally! All skill levels are welcome. All registrants will receive a detailed email upon registration on what to expect. 65+ft cotton or other soft rope. 5mm diameter. 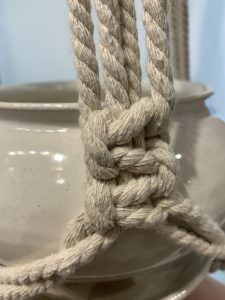 Suggested rope – 1 spool of the Bead Landing Cotton Rope from Michaels. Optional: handmade pottery to place in basket when complete. Tori is a former apprentice here at The Village Potters and sells her work here. But for those of you who have not met her yet here are a few words that come to mind when I think of Tori: powerhouse, skilled, motivated, inspiring, hard working, delightful and fun! Tori is a great teacher too. She received her Masters of Science in Education in Visual Art from State University of New York. 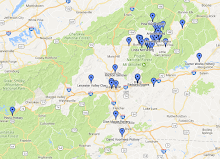 She wholesales and retails her work across the region and country and she founded, her brain child, The North Carolina Ceramics Arts Festival in 2017 with a small group of potters. It is already a successful and sought after show for potters. In her picture you see her with one of her first really big pots. Some of our friends at The Southern Highland Craft Guild named her “Little Big Potter” and she lives up to the name. So we encourage you to jump into this workshop. It’s going to be a great experience.